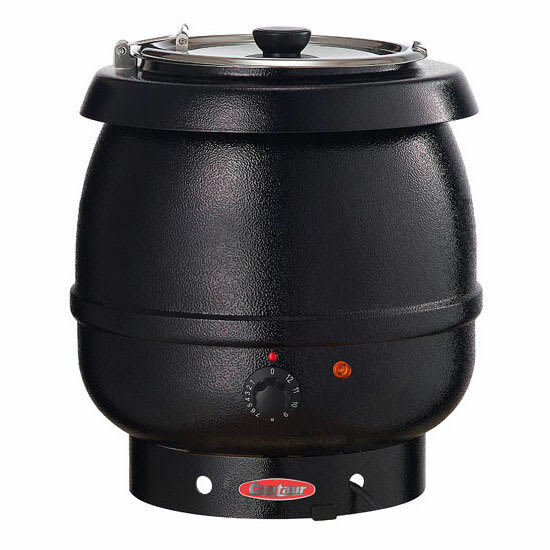 The Centaur ABSKB1 soup kettle is designed for countertop applications and includes a sturdy round base to provide stability on a number of surfaces. With a 10-quart capacity and plug-and-use functionality, it is ideal for warming soup or light sauces in buffet lines, serving stations, and prep areas. Although the soup kettle has 12 settings that provide adjustable and precise temperature options with an intuitive selection knob, it is meant for use as a warmer, not a cooker. For safe operation, the kettle should not be turned on unless the warming base is filled with 21⁄2 cups of water. The stainless steel soup pot is removable for easier cleaning, but the Centaur ABSKB1 kettle should never be used with any substitute insert. The lid, which is attached with a hinge, has stainless steel edges and a glass top that allows you to monitor the soup's progress without opening the lid. Other construction features include an aluminum body with fiberglass insulation, the exterior of which is black and powder-coated to complement a number of setups. The soup warmer also includes labels to make sure the product being warmed is properly identified.